I have discovered that at times when I look at centaur drawings, paintings, and sculpture that I see a perfect form. It’s not simply a “blending” of two perfect forms, the human body and the horse, it’s the whole, as if once you had centaurs you wouldn’t need either of the other. However, I see more than simply physical advantages. The human body and the horse are fine examples of exquisite beauty. We’ve probably seen enough of both in fine art to agree with that assessment. 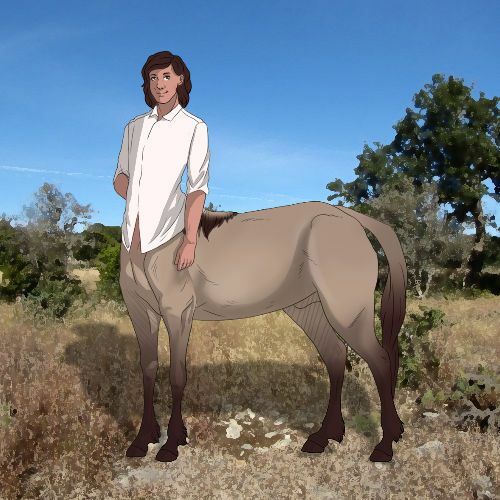 Centaurs show me a beauty akin to a spiritual saying “the whole is greater than the sum of its parts.” And so, when I gaze upon fine examples of the centaur form, I find that I am in awe of the whole. It doesn’t matter that they don’t exist physically in this reality; they tug at heart, and my sense of beauty, artistically and spiritually. The latter would have more to do with my connection to them and that my guides are centaurs. This observation of mine can (or should) be applied to any of the forms people find beautiful, whether of this world or not. Some would see angels as the perfect form, while others would see the dragon as perfect. None are “more perfect” than the other, only that we can all see in this light, observing whatever we find most beautiful as perfect. I think to fit the criteria of perfect any of us would have to be in total awe and wonder of those forms. And for those of you able to talk to those entities in those perfect forms, tell them how you see them, not just physically, but emotionally. If you identify as Otherkin, then tell yourself how amazed you are to be in such a perfect body. This is a topic I can explore further in my stories, partly from the point of view of the human trying to come to terms with a non-human entity, especially one they find pleasing to the eye and deeper emotions. Imagine the questions asked, such as “What’s it like being a centaur?” And the resulting perplexed reaction to such an asinine question. Then again, we have no idea what it’s like to be anything but human. How do you ask someone that isn’t human what it’s like for them?